We’d love your help. Let us know what’s wrong with this preview of Teddy's Favorite Toy by Christian Trimmer. Then one morning, something truly awful happens. And there’s only one woman fierce enough to save the day. Can Teddy’s m A mom goes to great lengths to rescue her son’s favorite doll in this delightful tribute to treasured toys—and mothers. To ask other readers questions about Teddy's Favorite Toy, please sign up. This should be on every child's bookshelf. There's a stance, but it's not overwhelming; it's integrated beautifully without feeling forced. 3.5 This is the first picture book I’ve ever read with the phrase ‘Yass queen!’ and I’m totally into it. When I picked up this book, I didn't really read the synopsis. I thought it would be some gender norm-shattering story about a little boy whose favourite toy just happens to be a fashion doll. But that part of the story is pretty much glossed over and taken for granted. It's really more of a story about a little boy idolizing his mother, and his favourite toy acting as a representation of everything he loves about her. Unfortunately, it also featured a rather inexplicable dose of cultural approp When I picked up this book, I didn't really read the synopsis. I thought it would be some gender norm-shattering story about a little boy whose favourite toy just happens to be a fashion doll. But that part of the story is pretty much glossed over and taken for granted. It's really more of a story about a little boy idolizing his mother, and his favourite toy acting as a representation of everything he loves about her. Unfortunately, it also featured a rather inexplicable dose of cultural appropriation. Teddy's favourite toy is a redheaded Barbie-like doll named Bren-Da, Warrior Queen of Pacifica. She has excellent manners, even better fighting skills, and she has an outfit for every occasion. (Seeing her dressed up in the shower scrubbie made me smile.) Teddy has plenty of other toys, but Bren-Da is his favourite... so when she loses her leg in an epic battle, of course he tries to save her. His doll-fixing skills aren't great, however, and she ends up looking like a trash-wrapped mummy... which leads to his mom throwing her in the garbage while he's at school. When the mom realizes what she's done, she (rather unbelievably) manages to chase down the garbage truck and rescue Bren-Da, using many of the doll's same parkour moves. At two points in the story, Teddy yells, "Yas, queen!" which I felt was just odd, and kind of inappropriate for someone his age. (Where on earth would he have learned that?) Because the phrase is considered cultural appropriation by some, I found it a little uncomfortable to see it coming out of the mouth of a little kid. I'd be afraid this book would encourage kids to use such phrases without realizing the background and significance of the words. Teddy has a lot of cool toys. Now, if the kid listening to the story isn't looking at the book, they're not going to get much out of it. There are other similar instances throughout the book, where the story is entirely dependent upon the pictures (like when Bren-Da loses her leg, and all the text says is: "this happened"), but this is the most glaring example of why this book needs to be seen as well as heard/read. The pictures are cute, but nothing special. I didn't notice that Teddy's mother was also a redhead until the end of the book, when I'd already noticed the parallel between her and the doll due to her physical skills. I'm still not sure why the mom threw Bren-Da away in the first place. The doll was all wound up with gum, tape, and troll-doll hair, and yet the mom--who was an artist herself--assumed she was trash and threw her away. This book is a must read for so many reasons. Thanks to my friend who handed this book to me! Teddy has lots of toys he likes, but only one favorite one: Bren-Da, the Warrior Queen of Pacifica. They have tea parties together and she has great manners. They fight battles together and she does a wonderful kick. She can dress up in different styles. But then one day, when Teddy is playing with her, Bren-Da’s leg snaps off. Teddy tries to fix her, but has to leave for school and he keeps her wrapped up in bandages until he can return. Unfortunately, Teddy’s mom cleans up his room and acciden Teddy has lots of toys he likes, but only one favorite one: Bren-Da, the Warrior Queen of Pacifica. They have tea parties together and she has great manners. They fight battles together and she does a wonderful kick. She can dress up in different styles. But then one day, when Teddy is playing with her, Bren-Da’s leg snaps off. Teddy tries to fix her, but has to leave for school and he keeps her wrapped up in bandages until he can return. Unfortunately, Teddy’s mom cleans up his room and accidentally throws Bren-Da out with the trash. What can they do? It’s up to Teddy’s mom to become a Warrior Queen herself. Such a great book and a must recommend. This book shows how far we have come in terms of acceptance in what kind of person you can be and what kind of people your children are and will become. So great. Teddy's favorite toy is "Bren-Da, Warrior Queen of Pacifica" with many skills. Wonderful story when Mom springs into action after throwing Bren-da away. One of the best picture books Ive ever come across! My favorite picture book of the year!!!! Yasssss, queen!!! My son's name is Teddy! Teddy's Favorite Toy by Christian Trimmer, illustrated by Madeline Valentine. PICTURE BOOK. Atheneum Books for Young Readers (Simon & Schuster), 2018. $18. 9781481480796. Teddy's favorite toy is an awesome doll he calls Bren-Da. She gets broken/injured during one of their adventures one morning, and Teddy uses various tapes, strings, etc to try and fix her up before school. While he's gone, his mom mistakes Bren-Da for garbage Teddy's Favorite Toy by Christian Trimmer, illustrated by Madeline Valentine. PICTURE BOOK. Atheneum Books for Young Readers (Simon & Schuster), 2018. $18. 9781481480796. Teddy's favorite toy is an awesome doll he calls Bren-Da. She gets broken/injured during one of their adventures one morning, and Teddy uses various tapes, strings, etc to try and fix her up before school. While he's gone, his mom mistakes Bren-Da for garbage and tosses her in the trash. When Teddy discovers the mistake, his Mom leaps into action and--like a superhero--saves Bren-Da and saves the day. The illustrations in this book are fun and the story is incredibly simple with the pictures telling a lot of the story. The point of this story is clearly more about the message of "Its okay for boys to like dolls" than it is about the actual storyline, and I think that is okay. By not pointedly saying it in the story, the author really does make it okay for Teddy to love a doll and I'm all for breaking down gender stereotypes. As such, I think this book does have a place in libraries and would be a great storytime read aloud. 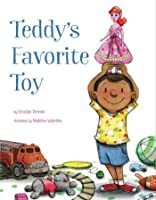 Teddy's Favorite Toy is a children's picture book written by Christian Trimmer and illustrated by Madeline Valentine, which is about a boy's favorite toy that his mother accidentally threw out and the lengths that she would go through to get the toy back. Trimmer's text is rather simple and straightforward. It is a fantastical tale about a mother who would go through great lengths to rescue her child's favorite toy. Valentine's illustrations are wonderful depicted and depicted the text rather wel Teddy's Favorite Toy is a children's picture book written by Christian Trimmer and illustrated by Madeline Valentine, which is about a boy's favorite toy that his mother accidentally threw out and the lengths that she would go through to get the toy back. Trimmer's text is rather simple and straightforward. It is a fantastical tale about a mother who would go through great lengths to rescue her child's favorite toy. Valentine's illustrations are wonderful depicted and depicted the text rather well. The premise of the book is rather straightforward. It is about a boy named Teddy and his favorite toy, a doll named Bren-Da, Warrior Queen of Pacifica. It broke during a morning of play and Teddy tried to fix it with little success. When Teddy was out at school, his mother accidentally threw it out, because she thought it was garbage. After hearing what she did, she goes through fantastical lengths to retrieve the treasure toy for her son. This is a cute little picture that immediately subverts expectations. You see a boy holding up a Barbie-doll clone on the cover and think that this is going to be a story about a kid defending his choices and values. But Teddy isn’t being bullied by other children or chastised by his parents to pick the “right” kind of toys. He enjoys his playthings, enjoys fooling around with them and does so without discrimination or knowledge that there’s anything odd about his choices. So what we get is a sto This is a cute little picture that immediately subverts expectations. You see a boy holding up a Barbie-doll clone on the cover and think that this is going to be a story about a kid defending his choices and values. But Teddy isn’t being bullied by other children or chastised by his parents to pick the “right” kind of toys. He enjoys his playthings, enjoys fooling around with them and does so without discrimination or knowledge that there’s anything odd about his choices. So what we get is a story much on the level of Knuffle Bunny, in which the little girl loses her precious toy and makes a fuss until it is retrieved. As in that tale, Teddy’s parent springs into action to retrieve Teddy’s beloved Bren-Da and all is well. This book follows Teddy and his favorite toy, an action doll. This doll does amazing things like fight bad guys. She also has awesome moves and knows how to do dropkicks. Teddy was playing with his favorite toy one day and her leg popped off. Teddy did his best to put her back together but had to leave for school leaving the doll in a pile in his room. His mom came and picked it up and throw the doll in the trash. When Teddy got home him and his mom realized what happened and his mom sprung into action. She ran and sprung her way to the garbage truck and saved Teddy's doll. Recommends it for: I wouldn't. Teddy loves to play--especially with his favorite toy: Bren-Da, Warrior Queen of Pacifica. But when mom is cleaning up and accidentally throws the broken doll, mom springs to action to save Bren-Da from the evil clutches of the garbage truck. The simplicity of the storyline makes this perfect for reading aloud. No adults are seen challenging or questioning Teddy's choices which normalizes the concept of loving what you love, no matter the gender norms. I didn't love this. The illustrations are bright and fun and it's nice that Teddy's favorite toy is traditionally feminine, but it's unrealistic that his mom could rescue the toy after the garbage took actually took it. I would've preferred if they bought or made a replacement, because that's a message kids need to hear - not that mom can bring back a toy from the dump! Also, I thought the "yas, queen"s were a little weird. Yes, that's absolutely common vernacular right now but I don't think it'l I didn't love this. The illustrations are bright and fun and it's nice that Teddy's favorite toy is traditionally feminine, but it's unrealistic that his mom could rescue the toy after the garbage took actually took it. I would've preferred if they bought or made a replacement, because that's a message kids need to hear - not that mom can bring back a toy from the dump! This picturebook sends a wonderful message to its readers and portrays a genuine love that a parent has for their child. The author, Christian Trimmer, is a credit to their profession and deserves many kudos. This is a very progressive story which is well overdue; I wish there were more books like this one when I was a child. I would definitely read this book in an all-age storytime. Yas, Queen! This is a lovely picture book that challenges gender norms. It shows Teddy playing with his favorite toy, a doll named Bren-Da, in nontraditional ways. I love how Teddy's view of Bren-Da as parallels the mom's actions later in the book too. Mom's are super heroes, even though her rescuing Bren-Da from the garbage truck was a little unbelievable. It is still cute and a book that I will be sure to recommend to patrons! What makes this book so deliciously provocative is that Teddy's favorite toy is a pink doll -- something society has tried to stamp as a girl toy. But then the author never addresses this wonderful twist and I think as a result misses out on an opportunity to buck the stereotype. Then I'm not a huge fan of the fact that it is Mom - not Teddy - who saves the day. May 2018 - suspend your disbelief about how easy it would be to retrieve your garbage from the garbage truck, and enjoy the way the story celebrates play. Teddy's favorite toy is a fabulous doll that is polite, fights hard, and enjoys many costume changes. I love the way his selection of toys is truly gender neutral, and the way his mom comes to the rescue. A rare picture book that pushes back at some gender stereotypes. Ben was an immediate fan. I LOVED this book. There are so many different things to absolutely adore about this book--from hilarious Teddy and his favorite toy, Bren-DA the Warrior Queen of Pacifica, to his dedicated and amazing mother rescuing said toy from a garbage truck. It was a realistic testament to the lengths that children and mothers will go to to keep things happy, calm, and joyful. Great story of acceptance and challenging gender roles and norms.